Living in Southern California, I don't get much time in the snow. We love going up to Big Bear to catch some of that wintery wonder. Creating a winter wonder scene during this hot July is a fun way to cool it down. Creating a Masked image is an easy way to customize a winter field. ~ Tear a long strip of paper/sticky note to create a snow scene. 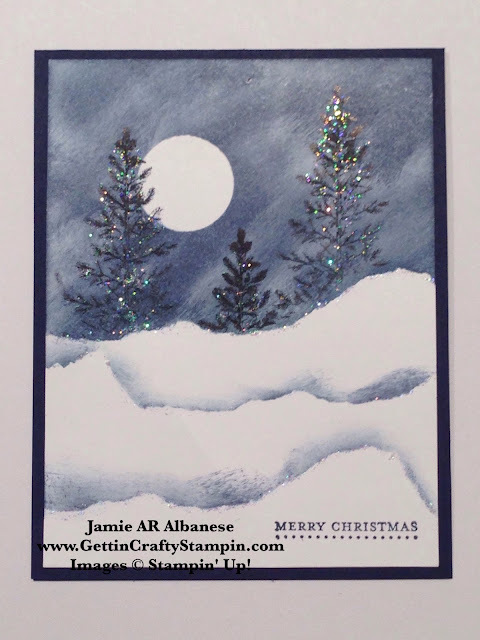 ~ Stamp the stunning pine tree from the Lovely As a Tree stamp set in Jet Black Stazon ink on the upper 1/3 of the Whisper White card stock in varying heights. ~ Punch a 1" Circle in the sticky note. Cover part of the 'sky'. I like to have the 'moon' peek through the branches of the trees. 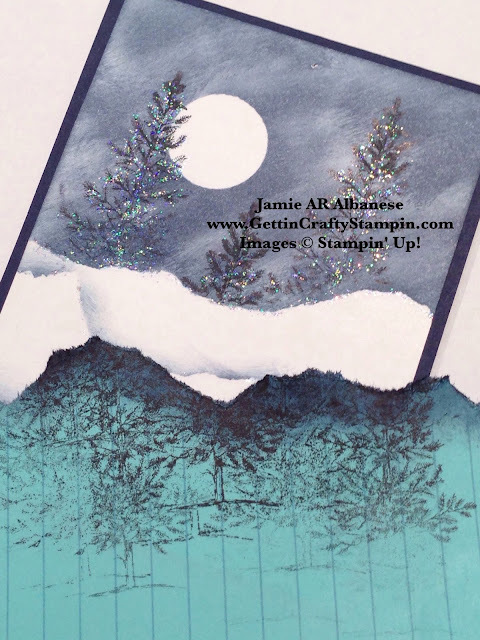 ~ Using the Stamping Sponge in the Night of Navy ink pad to create the winter night scene. I like to alternate sides and move the sticky note so that it has interest and variety. Sponge, close to the edge, a couple more hills of snow as you go down. Stamp the 'Merry Christmas' from the (must-have) Teeny Tiny Wishes stamp set in the Night of Navy ink pad at the bottom of the snow scene. 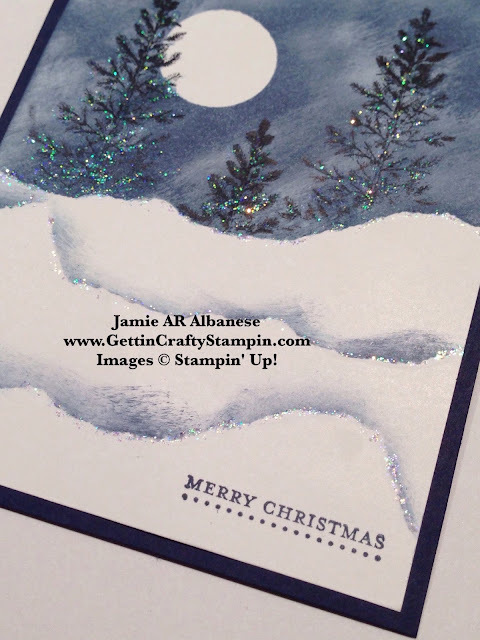 Add some sparkle - I LOVE the Dazzling Details glitter adhesive!! Nooo words for the ease and fun of using this on your hand-stamped projects! Here I added a dot to the center of the tree and snow line and using the tip of the bottle to spread it thin. A little sparkle goes a long way to make this hand-crafted card POP! This holiday season will sneak up on us quicker than we are ready for! I'm excited to be a step ahead in my holiday card making!! 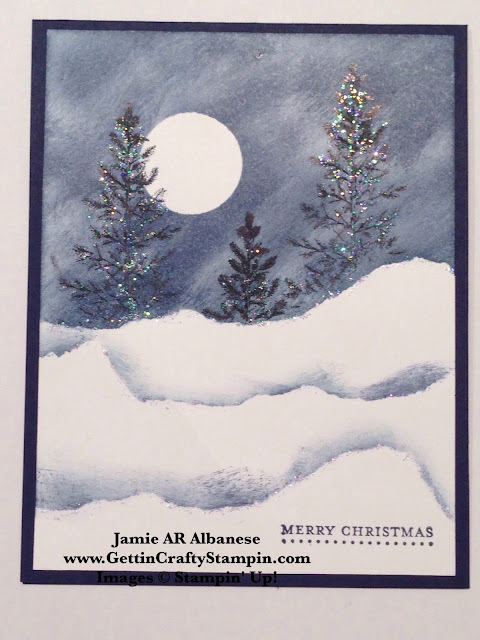 JOIN US in the upcoming Holiday Card Stack Classes (20 cards in one fun-filled night) on the August 26th and the First Friday of , September, October and November and be ready for the holidays before they are here!! Shine and add sparkle to those you care for when you deliver a hand-stamped holiday card that will delight and show that you care (and that you ROCK!! ).